New Zealand's famous glaciers are looking "sad and dirty" after another brutally warm summer, says a scientist who took part in this year's aerial stocktake. Each year, the Niwa-led snowline survey checks the health of about 50 glaciers across the Southern Alps. After the record-hot summer of 2017-18, scientists were struck by how many mountains had been stripped of ice and snow. The latest flight, undertaken last week, and following New Zealand's third warmest summer, found many of the glaciers still in a sorry state - and some had disappeared altogether. "I'd say it was unimpressive - in fact, it's quite concerning… sad and dirty is still the story," Niwa climate scientist Drew Lorrey said, "Last year, the vast majority of glaciers had snowlines that were off the top of the mountain, and this year, we had some where we could see snowlines on, but they were very high. Glacier fluctuations were among the clearest signals of climate change, because they were highly sensitive indicators of atmospheric temperature and precipitation levels. 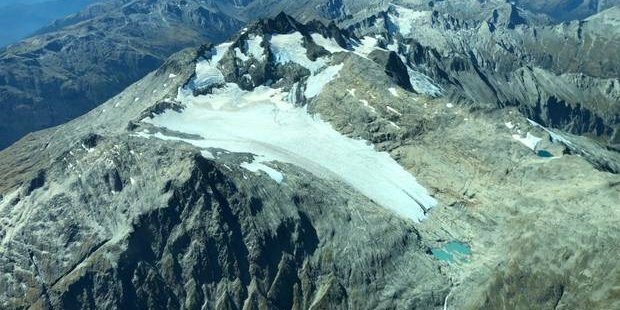 Scientists believe it was a warming planet that had partly caused New Zealand's glaciers to shrink in total volume by one third in just four decades of observations. Lorrey expected the impact of warmer sea surfaces on local climate – especially the freak marine heatwave that engulfed New Zealand over the summer of 2017-18 – were much to blame for the recent melt. Research recently presented by climate scientist Professor Jim Salinger indicated that, over 2017-18, the alps experienced their biggest snow melt on record, losing about 9 per cent of their total ice volume.